Comments: Scottsville Baptists built their red brick church high on Harrison Street in 1840 with property and funds donated by Anna Maria (Barclay) Moon and her husband, Edward Harris Moon. Before the church was built, Anna held services for her family and slaves in her own home at Viewmont, near Carter's Bridge. Interest in the Baptist religion grew in Scottsville, and in 1840 the local Baptists approached Anna, whose religious fervor was well known. Her husband, Edward, was a Presbyterian, and his minister became disturbed about Edward's convictions and the growing Baptist activity. As it turned out, his fears were well-grounded for Edward was baptized and became a member of the Scottsville Baptist Church as soon as it was organized. He also contributed generously to the church building fund and donated a sofa and chairs from Viewmont to furnish the church pulpit. The plan of the church included separate entrances for women and men and a slave gallery above the auditorium, both common features at that time. Two of the first Baptist ministers were S.B. Rice (1842) and Joseph H. Fox (1845). By 1849, the church had grown to 249 members of which 119 were white and 130 colored. Notable members of the early Baptist congregation included the Moons' two daughters, Lottie and Oriana Moon. Lottie Moon became a famous Baptist missionary to North China and translated the Bible into Chinese. Dr. Oriana Moon graduated from medical school in 1857, and, a year later, she joined her uncle, Dr. James Turner Barclay, on his Disciples of Christ mission in Jerusalem. Dr. Moon later married Dr. John S. Andrews and volunteered as a surgeon in the Confederate Army during the Civil War; she began work at Charlottesville General Hospital in July 1861. After the Civil War, the Andrews ran a hospital at Old Hall on Scottsville's Harrison Street from 1882-1883. During the Civil War, the Confederate Army impressed the Baptist Church as a hospital, and its first patients arrived on 24 June 1862. Although the Church had space for only 20 patients with its one large ward and second floor gallery, it was part of the Confederate General Hospital complex in Scottsville, which consisted of four buildings and treated 2,236 soldiers in its nearly 16-month period of operation. In the early 1900's, the Baptist congregation built a wide porch with four white pillars across the front of the Church as shown in this second Burgess postcard just above. The church was remodeled in 1930 to add a baptistry; until that remodeling, all baptisms had been performed in the James River or nearby streams. During the 1930 remodeling, heating stoves were removed and central heat installed. The photo to the immediate right shows this beautiful church in 2000. In 1773, the old Lewis Meeting House, just west of Charlottesville, was the center for the Baptist work in early Albemarle County. It was from a branch of this work that activity in Scottsville sprang in 1840, the same year that Lottie Moon was born. Anna and Edward H. Moon, Lottie's parents, were leaders of the newly organized church in Scottsville. By 1842, the church had 40 members and had S. B. Rice as its first pastor. Three years later, Joseph H. Fox was pastor, and interestingly enough, in 1849 there were 240 members of whom 119 were white and 131 were black. In 1855, the Sunday School and the church were flourishing with Peter C. Hoge as pastor. In a very unsettled period beginning in 1860, J.A. Doll, Charles Wingfield, and R. Baker Boatwright all preached briefly at Scottsville. During four dark years of civil war, there was no minister, and the church almost disorganized. The church building was used at that time, not as a hospital, as some have said, but as a hospice and shelter for the wounded. But somehow during this bleak period, the Sunday School had survived notably. In the years following the Civil War, pastors changed rapidly: 1868, J.C. Long; 1871, J.T. Patterson; 1878, W.C. Hall; 1882, John T. Lynch; and 1883, W.W. Wood. In 1887, J.R. Daniel became pastor and served for a long satisfying period until 1906. The church took on a new vitality when, in 1908, Leslie H. Walton became pastor. This man was interested in all public affairs, especially education. The Scottsville Baptist Church was one of a field of four at this time. H. Lee Scott became pastor in 1924 and served for three years. 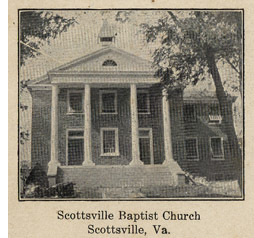 Scottsville Baptists were alive and well when Oscar E. Northen began his long, successful ministry as pastor in 1927. Under his leadership, the church continued to thrive, and many developments took place, including the remodeling of the church in 1930. The 100th anniversary of Scottsville Baptist Church was celebrated on Sunday, July 7, 1940, and with this began what many have called the 'Golden Era' of the church, which was to continue for the next two decades. Charles A. Morgan, Jr., became pastor in 1944, and, with his love for music, he was instrumental in having an electric organ installed and organizing a large choir. The church decided to build a modern parsonage (the present one) in 1952, the same year that John P. Elliott, Jr., was called as pastor of the three churches on the field at that time. At Scottsville, there were three active circles of Woman's Missionary Union, an energetic Royal Ambassadors chapter, a vital Girls' Auxiliary group, a Young Women's Auxiliary, and a Baptist Training Union. The 1950's saw many physical improvements to the church and grounds, including the addition of parking lots. 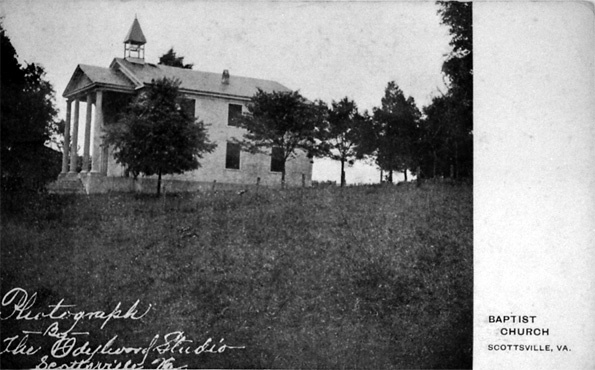 With an attendance of 150-175 at Sunday School, more classroom space was needed, so in 1957 the purchase of the Hill/Dunn property and house next to the churchyard provided a useful annex. The building of a new baptistry behind the pulpit was the main feature of the 1959 remodeling. Under Reverend Elliott's leadership, the church became full-time with services every Sunday in 1961. Church membership was then well over 300. 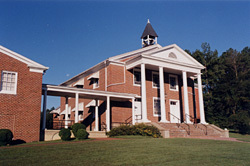 In the period between 1964 and 1967, a new two-storied multi-purpose Educational Building was built adjoining the church. The new facility made possible an expanded youth program which saw development over the next few years. The late 1960's through 1970's and 1980's saw pastorships of Rudolph Ramsey (1968-69), Paul de Vries (1971-76), H. Ed Nicholson (Interim 1976-78) and James Jetton (1978-87), each one unique in his ministry as he felt led by God and took up the task. With so many aspects of life changing, it was a definite challenge to lead a church and people in the past two decades. An air-conditioned sanctuary, cushioned pews, and new carpeting were among the physical traits of progress; the spiritual growth and influence are impossible to measure. In 1987, Mark E. King became pastor and accepted the challenge of breathing new life into an old, established church which had experienced momentary discord and set-back, but which had not lost its clear sense of purpose, mission, and service. Mark nobly led in a period of healing and adjustment, and in August 1990, "the Church on the Hill" was able to celebrate its Sesquicentennial with a homecoming and historic pageant. Michael S. Lee was called to lead the church in October 1994 and was ordained by the church for his first pastorate. Mike placed emphasis on discipleship and the strengthening of the Sunday School, the Church Council, and church membership and community relations. While he was pastor, Mike earned his Doctor of Ministry Degree from Baptist Theological Seminary at Richmond. For the next two years after Dr. Lee left, the church was fortunate to have the services as Interim Minister of Dr. Jeff Cranford of the Virginia Baptist Mission Board. In addition, Dr. Cranford led the general membership and church officers in a self-study and planning for the future. On July 13, 2008, the Reverend Israel Maxwell, a graduate of Oklahoma Baptist University and of Southwestern Baptist Theological Seminary in Fort Worth, Texas, and a fourth-generation minister, became the pastor of Scottsville Baptist Church. He and his wife, April, a special education teacher and former missionary, had just moved into the parsonage and were eager to begin a new field of ministry here. As it anticipates its 170th anniversary in 2010, "the Church on the Hill", always mission-minded and having strong community ties, continues to be a beacon seeking to light the way to Christ's Kingdom here and hereafter.